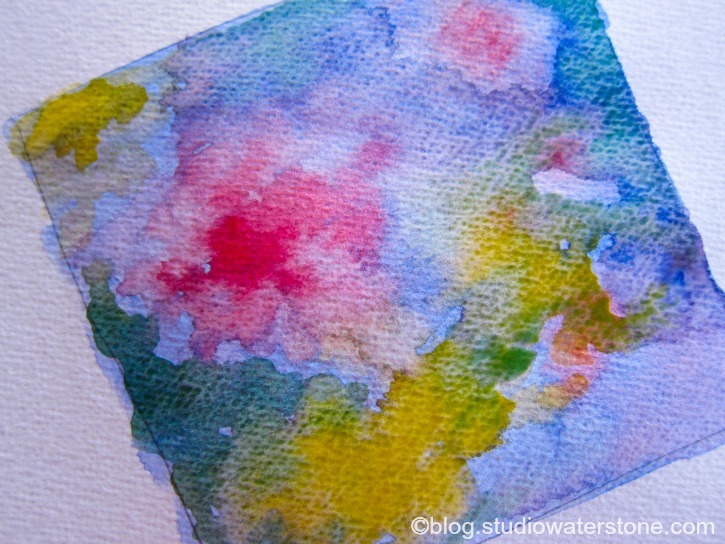 Watercolor Painting 101 is a place to learn about the art of watercolor in a relaxed, non-threatening way. 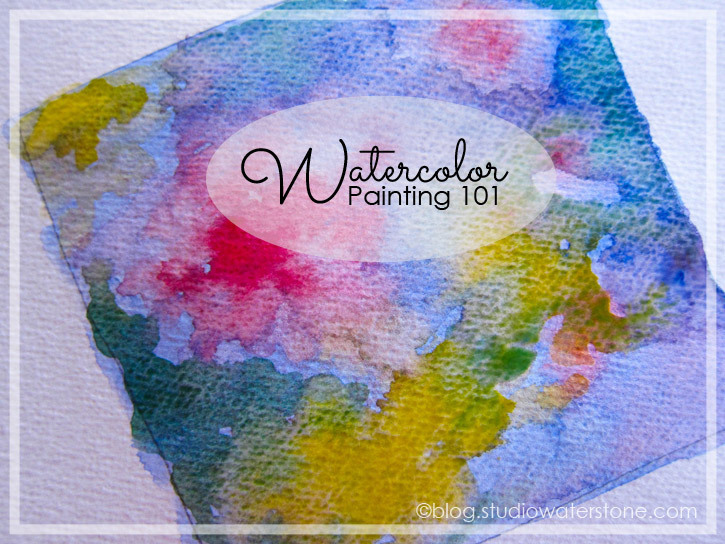 If you're new here, please take a look at the watercolor 101 page to see earlier lessons. For today, we'll learn how to make a simple flat wash and then we're going to get creative. For this exercise you can use either a larger round brush (size 8 or 10) or a 1" flat brush. The flat brush will be easier, but you can use either. 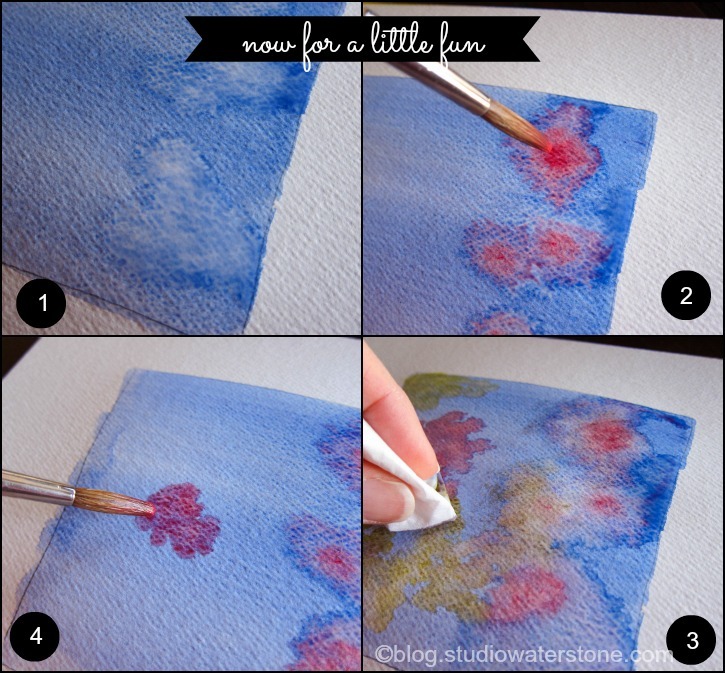 You'll also need a pencil, your watercolor paper, paints, a paper towel and a jar of clear water. Before getting started, add a few drops of water to your paints and grab a beverage while they loosen up. 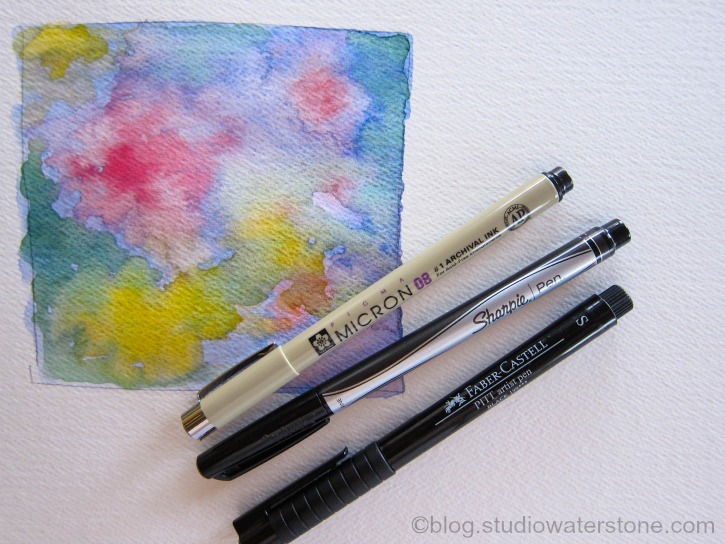 First, draw a rectangle on your watercolor paper. Don't worry about being precise - I freehanded mine and remember, this is supposed to be fun. So, have at it without any stressing. With your brush and clear water, lightly dampen inside the rectangle. 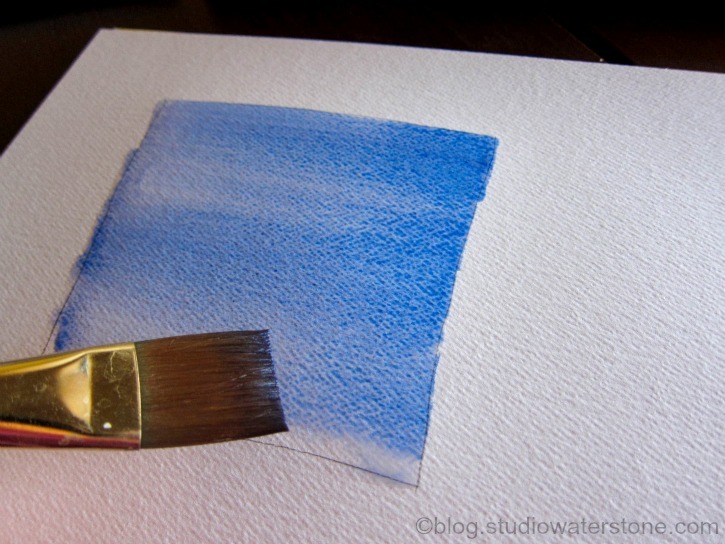 Now, load your brush (also called charging your brush) with a deep color wash. I used ultramarine blue. 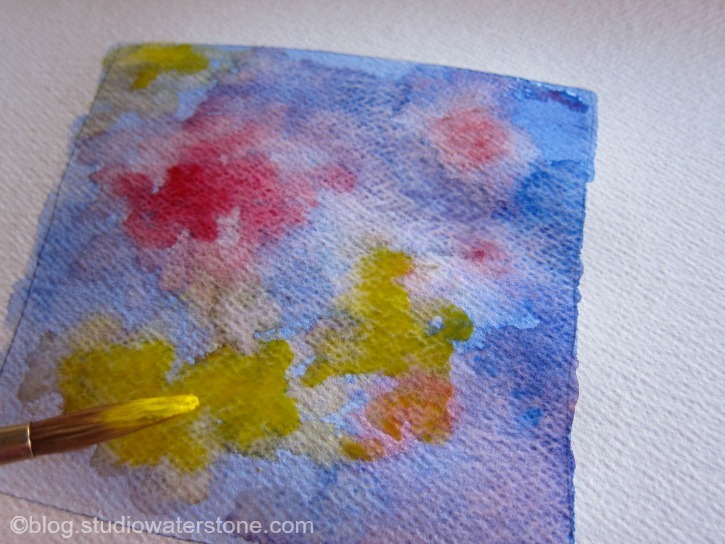 Tilt the watercolor pad a little as you're working and pull your brush across the top (left handed - pull right to left. right handed - pull left to right) Recharge your brush and begin line two, overlapping the previous line a little. Repeat until you reach the bottom. Your paint may drip. If this bothers you, dab the bottom edge of the rectangle with your paper towel to pull up the paint. As the paint dries it should blend pretty well. You, my friend, have just completed your first flat wash. Take a bow. Step 1: Add a few drops of water to your flat wash as shown. Notice how the water interacts with the colored wash, pushing back and intensifying the colored edges? This is called a backwash and depending on the effect you're looking for, a backwash can be a wonderful thing or a bad thing. For us? It's a wonderful thing. Takeaway Tip: If you're aiming for a smooth and even layer, don't add any more paint to a damp wash or you could walk away with a serious case of backwash. A backwash happens because you're combining varying degrees of dryness. Takeaway Tip: Make sure that you don't have too many areas with the three prime colors completely overlapping. If you do, and according to lesson one, you will end up with mud. So, unless you're looking for mud, stay away from combining all three colors. Steps 3 and 4: Allow some areas to dry and apply more layers, playing with backwashes and color effects. Use your paper towel and dab it onto different areas. Part two will involve your gorgeously colorful abstract painting and a fine black marker. I'm showing you three here, a Micron pen, fine Sharpie pen, and a Faber-Castell artist pen. Any fine black marker will do. Part two should appear early next week. Questions? Fire away and I'll give it my best shot. Finished your flat wash? Link up here to share your work. Well, you are just amazing! I have not been hear for a long long time, and look what I am missing! I always wanted to try watercolors, I am sooo afraid! I worked extensively in oils in college, it's time to try soemthing new...thank you for the wealth of information...you are so kind! thank you !!! I try to paint when i feel for it, but I'm not that good. And watercoloring... UI never understood how it works . i learnt a lot from your post !!! Fun. I am enjoying playing with watercolors again. Oh, I can't wait to try this over the weekend! This looks like such a fun technique!! Thanks Lori!! OOOHHHOOWW I love these instruction, I just click on your blog and didn't even see all this fab tell all, thanks a bunch and have a great week..
Dear Lori - Here is my post showing a bit of my "wash" exercise that I just did a few weeks ago. I notice I tend to use too much water and the colors get so mixed up it's muddy all on it's own! You can't see that part in the photo, lol! I may need to practice controlling the water in order to manipulate the pigments a bit more...does that sound like I'm on the right track..or am I about to veer off? Your time is so much appreciated!